The internet has become an essential part of our everyday life. We use it personally to catch up on the latest news, our relatives, and friends. Additionally, the internet has become a major constituent of any successful business. Using the internet, you can expand your business’s reach to a global audience while also establishing your brand for little to no cost. This makes the internet an essential tool for your business’s growth and that is why we should fully understand it. Join us on this journey where we identify what is the internet, how it began and how we can utilize it for maximal exposure. The internet has quite the history. Over the many years, it has been adapted to suit its users. The thing with the internet is that it is constantly changing. This requires you to understand its history in order to better predict it in the future. The internet was initially used for research and military purposes in order to share information to devices. There were several independent networks that each used a different method of connecting these devices. Allow us to take you through the journey of the various developed networks that ultimately lead to the creation of the internet through time. The concept of a computer network was first established by scientists in order to collaborate and share scientific data across several computers. The first established connection was between a computer in UCLA and Stanford using ARPANET in 1969. This was a network of connected devices that used already existing phone lines. The first message that they had sent was the word “Login”. However, the network crashed and the receiving computer was able to receive the first two letters “LO”. Those two letters acted as a proof of concept and thus began the development of several methods to connect devices over long distances. The next prominent breakthrough happened in 1973 when engineers established a packet radio network (PRNET) which utilized radio transmitters and receivers to connect device instead of the traditional use of phone lines. This allowed for the creation of a large network of devices due to the ease of transmission of radio waves, however, that did not come without its challenges. To begin with, Your average radio equipment at the time was made with the intention of transmitting voice and not data. Voice is a form of analog data which means that it requires the processing of an entire wave where every fluctuation matters. Conversely, digital data is a form of binary data which consists of either on or off signals with no intermediates. In 1977, another prominent technology was developed that allowed the connection of devices using satellites. And despite its relatively expensive nature, it proved to be quite convenient to connect devices that were mobile or in uninhabited areas. With each of this network having its own benefits, it was agreed upon that they should all be interconnected. This inter-networking is what is the internet is known as today. It initially started as a way to integrate the various networking technologies into one big network. In its early days, the internet was still uncommon. It was limited to scientific and military applications mainly because of the complicated set-up required to access the network. The biggest obstacle was navigating the internet which eventually led to the creation of the world wide web. As the development of networks continued, the only natural progression was to introduce it to the masses. This meant that the internet would be used by everyone which required its required devices to be accessible. This led to the creation of modems which are devices that are able to convert our traditional analog data to the computer’s digital ones. Despite these devices being quite simple, the fate of the internet relied on their creation. Because it would have simply been too expensive to recreate our preexisting networks in a digital format. You can use these modems to utilize preexisting phone lines to transfer your data, making the internet accessible to anyone. In 1990, Tim Berners-Lee introduced the concept of the world wide web which was a global collection of resources that were always available online and were accessible using HTTP. You could use HTTP to access any online resource regardless of other computer connectivity since they now had a permanent address. This was the basis for the widespread of the internet since you no longer had to directly connect to another computer. Additionally, the first web browser was called “WorldWideWeb” and it allowed users to access text-only web pages. However, it was only compatible with a fairly technical operating system that most users did not have access to. Next came the Mosaic web browser which supported Windows, Macintosh and Unix. The increased accessibility of this browser had consequently led to the popularization of the internet, allowing the average user to access it. Universities and business entities adopted this technology and in 1994, the internet was widely used for commerce and for personal use. What Is the Internet (As We Know It)? Throughout the years, the reasons for using the internet has changed. From strictly military to research and eventually for the average user. This required the simplification of the internet to allow anyone to use it without any complicated hardware or tech knowledge. Now let us look at the previous versions of the internet that closely resemble our current one. If you were using the internet before 2004, you are probably familiar with Web 1.0. To you, as a consumer, it was the first version of the world wide web that focused on accessibility. You would use Web 1.0 to access static web pages that were linked to each other via hyperlinks. Unfortunately, due to a lack of technology, you could only use these websites to obtain information and you were unable to interact with it. You could browse the various web pages to obtain information but you could not add your own. This was the first application of the commerce on the internet. Various business owners used the web 1.0 in order to display their product in an informative and eye-catching way. You should be familiar with this version since it is what most sites use to this day. Our first experience with web 2.0 started in 2004. 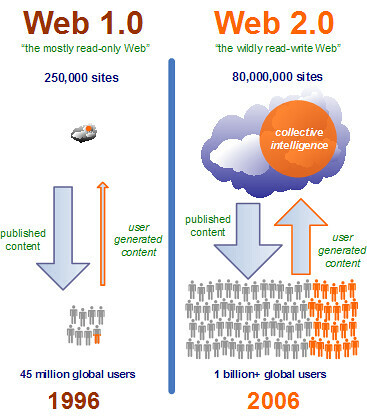 You can use web 2.0 enabled sites to interact or create your own content within web pages allowing for much more creative and productive uses of the internet. You could engage in conversations, discussion, and collaboration with other users. This established the internet as a useful tool for social interactions. At this point, everyone has realized the importance of the internet. In 2006, The Time magazine’s “person of the year” for 2006 was “You” in reference to all the users that have contributed to the growth of the internet. This was due to the massive amount of content created by everyday users that served to educate, entertain and inform a global audience. Ever since web 2.0, the internet has relied heavily on everyday users to create content. This allowed for a massive amount of information to be passed on which is considered to be the greatest human achievement since the creation of writing. What Is the Internet Most Known For? After the increased popularity of the internet, many websites have been created to act as a platform for users to communicate, share content and collaborate. There are millions of web pages out there. But you’ll find some of the most prominent ones listed below to help you maximize your gains from using the internet. Allow us to take you through this journey of the most popular online websites. Google Assistant: Your very own voice-controlled personal assistant that is available on most Android devices. You can use it to search the internet, set reminders and even tell you a couple of jokes. Google Hangouts: This great service will allow you to conduct voice and video calls over the internet. You can use this service to arrange external meetings or even just to catch up with your friends. Google Play: You can use google’s play store to download thousands of apps for your android devices. These apps will help you in both your professional and personal life. Google Maps: Google’s maps app is the product of extensive research and hard work in order to document the planet. You can use it in almost every country you’ll find it to be an essential tool for finding places or simply navigating in your everyday commute. Google Drive: You can use google drive to host and share your files online with anyone across the globe. You can also use Google Docs to edit your files on the fly and even work simultaneously with others. Twitter is perhaps what is the internet most known for. You can use this social media website to stay up to date with the latest world news while also keeping track of your friends. After you choose your Twitter handle, you can utilize social media marketing strategies. If you’re interested in expanding your business’s brand through Twitter, check out our list of the top twitter tools. Your goal as a business owner is to get your account verified. This improves your digital brand while also allowing for better quality interactions with other verified accounts. Youtube is considered to be what is the internet’s homepage for videos. You can use youtube to browse through over 300 hours of video content uploaded per minute. Thankfully, you can use their search feature to find exactly what you are looking for. If you’re interested in creating your own content, be sure to check out our guide on how to make a youtube channel. Once you’re comfortable with the platform, you might find it beneficial to monetize your content to maximize your benefits from your online brand. In addition to being a great platform for video content, you can also use youtube to track the analytics of your audience which allows you to have a much better understanding of your target market. What is the internet but a collaboration of individuals to spread information? Wikipedia perfectly captures that with its millions of user-created pages about practically anything. You can find expert explanations about any topic and the best part is that it is completely free. Wikipedia’s model depends on individuals creating and curating pages to minimize the cost of dedicated editors. Everyone can contribute in their field of expertise for the sake of mutual benefit. Amazon is the internet’s #1 online retail service. You can practically buy anything from there. From electronics to fresh groceries, Amazon has worked hard to establish itself as the go-to website for online shopping. This benefits both consumers and business owners. This is done by allowing businesses to save money by not opening traditional shops which in turn translates into lower prices for the consumers. Reddit is your go-to website if you’re looking to join a community. This website is divided into subreddits, each dedicated to a certain topic or hobby. You’ll usually be able to find advice and discussions about anything you have in mind. And if you can’t find it, you’re always welcome to start a new thread and kick-start the conversation. Be sure to check out our Reddit guide if you’d like to learn more about how to integrate into your relevant community. What Is the Internet Used for in Business? When it comes to businesses, what is the internet but a digital channel for marketing? Digital marketing campaigns are different from traditional campaigns in that they are not restricted to a physical location. Additionally, you’ll find that digital marketing campaigns are a lot easier to track and evaluate. If you’d like to start your first digital marketing campaign, be sure to check out our guide on the best digital marketing tools. Alternatively, you might find it simpler to simply hire a digital advertising agency to do the hard work for you. Influencer marketing is another great product of the internet. You can use the internet to find popular individuals that are relevant to your target audience. You can then choose to implement affiliate marketing to create a relationship of mutual benefit for your business and the influencer. Simply, you can choose to reward the influencer for the number of people they attract to your business which is extremely cost-effective since you’ll only be paying for verified exposure. Guerilla marketing is all about the effective use of your resources in order to maximize exposure. And what is the internet most popular for? Efficiency. By using the internet as your marketing channel, you can save a lot of costs that you would otherwise pay to advertisers. This allows you to conduct a lot more campaigns which complements guerilla marketing’s concept of encirclement. Thanks to the internet, you have an open two-way channel between you and the target audience. This is an incredible opportunity to build your brand while also winning over customer loyalty. Content marketing can be in the form of text, videos or even pictures. When it comes to content marketing, you need to be familiar with your target audience and their interests. Your aim should be to direct their traffic towards your page by addressing keywords that they find interesting. This makes timing very important which is why you should check our article about content plans in order to ensure you’re always ahead of the competition. Thanks to search engines, customers can find products or services that they didn’t even know that they existed. This makes your ranking on a search engine results page (SERP) extremely beneficial to the organic growth of your business. Search engines have their own set of rules that allows them to rank websites. To begin with, you should conduct an SEO audit in order to fix any major problems that your page currently has. Then you can learn about the various SEO techniques to help you boost your website’s traffic. The invention of the internet led to a massive change in how we obtain information. This makes it one of the most important inventions since language and thus, it must be understood properly. This article should put you on the right track to understand how it works. Regarding its history, you’ll find that the internet can be quite interesting. From two computers sending a simple message to multiple networks that eventually joined together to form what is the internet as we know it. It’s a long journey full of innovation. We’ve also provided you with a brief description of some of the most popular websites available on the internet. Additionally, you can also read about how you can utilize the internet to market your business. Be sure to check out our article on online marketing courses to learn more about ways to utilize the internet in your professional life.